This is the way to "Do Up You, Girlfriend"....Great to wear to barbeque's, to your bridal shower, out with your honey and all his friends.ﾠ This is a scene stealer and will keep you in the spotlight. Great as a shower gift too!ﾠ Splurge!!! 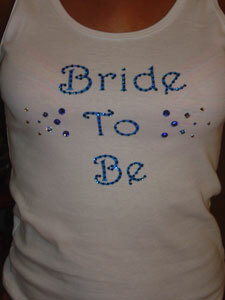 You deserve it!ﾠ Totally blinged out text, spellingﾠ "Bride To Be" in Swarovski Crystals and accented all around in more Swarovski Crystals....Next to diamonds, rich men and Mercedes, this is a girls best friend!! !